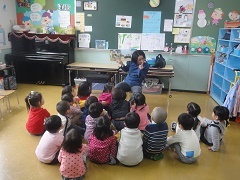 Today in Class 1, two mothers came to read storybooks to the children. 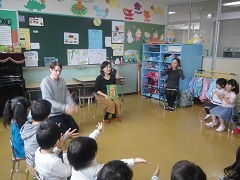 We were so happy to have them and the children really enjoyed the books they brought. One was Japanese and one was English. The first book was about a a grandpa and grandson losing their belly buttons to thunder ogres, but it was okay and fun! Next, the English book was about shopping with mommy and “What’s in the cart?” Thank you so much to the mothers who came and read. We are so thankful!